Astronomers refer to Orion as M42, but ancient humanity knew about this constellation thousands of years before modern day astronomy, without telescopes such as the Hubble. The questions are how and why? Orion’s is a place where stars are born and astronomers refer to it as a “Stellar Nursery.” The Orion constellation is one of the most prominent star formations in the night sky, and is one of the most famous constellations today, easily identified in the clear night sky. It is named after the Greek demigod Orion in the 8th century B.C. When you connect the stars; they form the head, shoulders, belt and feet of a man. The three principal stars in the constellation are Alnilam, Alnitak, and Mintaka which form the belt stars of Orion. The ancient Egyptians linked Osiris with creationand some researchers believe that Osiris and Orion are actually the same phenomena. Unas who ruled for 30 years and finally making his final voyage to the star system Orion. The Descending Passage pointed to the pole star Alpha Draconis, circa 2170-2144 BCE. This was the North Star at that point in time. No other star has aligned with the passage since then.The southern shaft in the King’s Chamber pointed to the star Al Nitak (Zeta Orionis) in the constellation Orion, circa 2450 BCE. And as we mentioned before, the Orion constellation was associated with the Egyptian god Osiris. No other star aligned with this shaft during that time in history. 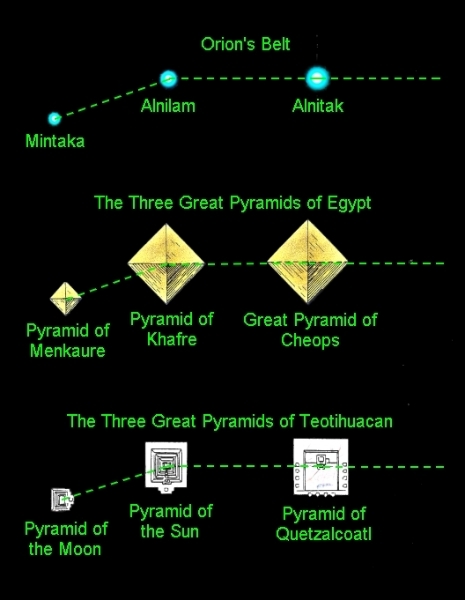 The apex of the Pyramid, corresponds to the geographical pole, while the perimeter of the Pyramid corresponds to the equator, both in proper scale. Each flat face of the Pyramid was designed to represent one curved quarter of the northern hemisphere (a spherical quadrant of 90°). The Babylonian star catalogs describe the precise movements of various celestial bodies, and according to some researchers, these clay tablets provide proof that the ancient civilization of Babylon obtained celestial knowledge from star travelers, extraterrestrial beings that came to Earth in the remote past. The Babylonian star catalogs are a collection of information with extremely accurate mathematical equations and more importantly distance between planets and archaeologists and researchers are baffled and cannot answer the question how a civilization in the past could have had this kind of knowledge.